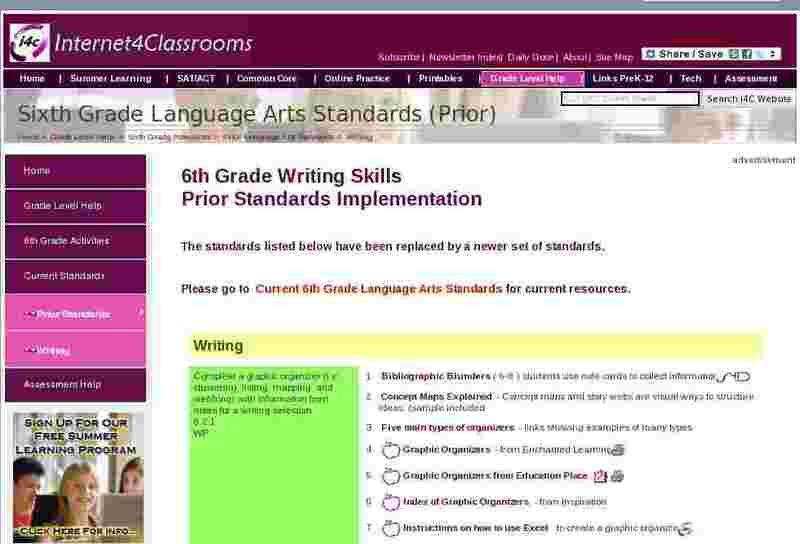 Please go to Current 6th Grade Language Arts Standards for current resources. Complete a graphic organizer (i.e., clustering, listing, mapping, and webbing) with information from notes for a writing selection. Select an appropriate title that reflects the topic of a written selection. Identify the purpose for writing (i.e., to inform, to describe, to explain, and to persuade). Identify the audience for which a text is written. Identify the most reliable sources of information for preparing a report or project. The ABC's of Web Site Evaluation (presented by Kathy Schrock) - Evaluation of Web sites is an important skill to learn in this age of digital and information literacy. Students and teachers need practice in critically examining sites to determine authority, authenticity, and applicability to purpose. This site provides that practice. Critical Evaluation of Resources - In the research process you will encounter many types of resources including books, articles and web sites. But not everything you find on your topic will be suitable. How do you make sense of what is out there and evaluate its authority and appropriateness for your research? Evaluation of information sources - This page contains pointers to criteria for evaluating information resources, particularly those on the Internet. Quality Information Check List -a resource to help young people evaluate the information they find on the Internet. Teaching Zack to think (from Alan November) - it is essential that students learn how to validate information. Rearrange multi-paragraphed work in a logical and coherent order. Select appropriate time-order or transitional words/phrases to enhance the flow of a writing sample. Select an appropriate concluding sentence for a well-developed paragraph. Select the best way to combine sentences to provide syntactic variety within context. Identify sentences irrelevant to a paragraph’s theme or flow. Choose the supporting sentence that best fits the context flow of ideas in a paragraph. Supply a missing piece of information in an outline. Rank possible research resources according to reliability. Select illustrations, descriptions, and/or facts to support key ideas. Select an appropriate thesis statement for a writing sample. Thesis Statement - [from LEO] "a thesis takes a stand rather than announcing a subject"
Write a Thesis Statement - [from Cliffs Notes] includes a "magic working thesis equation"
The FCAT Sample Test Books are designed to help students become familiar with FCAT (Florida) by providing helpful hints and offering practice answering questions in different formats. Half of this document is math and half is reading.